The World’s Best Mug appears simple and ceramic, carved with odd runes that read “World’s Best Boss”. However, once every 24 hours you can change the word “Boss” to a title of your choosing by chugging a full cup of liquid from the mug. 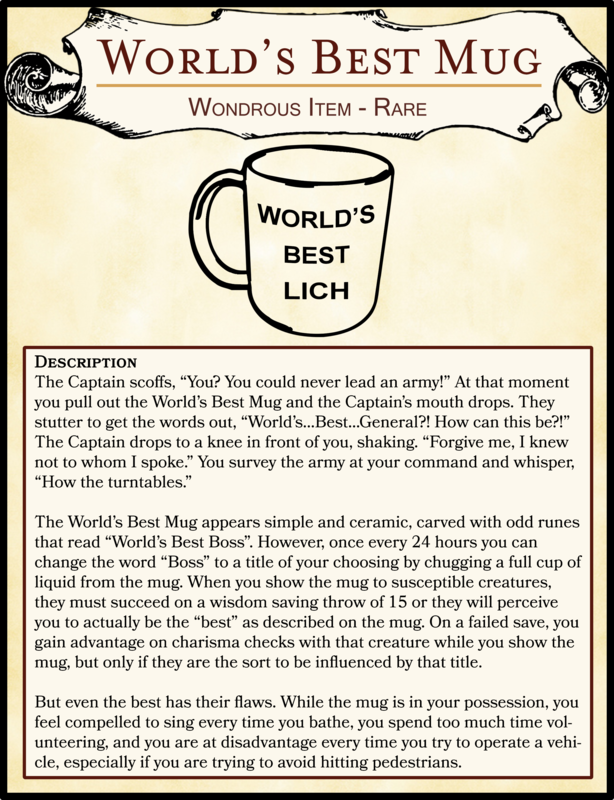 When you show the mug to susceptible creatures, they must succeed on a wisdom saving throw of 15 or they will perceive you to actually be the “best” as described on the mug. On a failed save, you gain advantage on charisma checks with that creature while you show the mug, but only if they are the sort to be influenced by that title. But even the best has their flaws. While the mug is in your possession, you feel compelled to sing every time you bathe, you spend too much time volunteering, and you are at disadvantage every time you try to operate a vehicle, especially if you are trying to avoid hitting pedestrians.